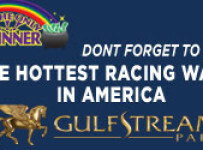 As Gulfstream Park heads into the final two days of its summer meet, excitement is building about Saturday’s meet-closing card that will have eight stakes races and mandatory payouts on the Rainbow 6 and all other exotic bets. First comes Friday with eleven races and first post of 1:15 p.m. The Friday carryover on the Rainbow 6 is $104,270. It is on races six through eleven. It is a 20-cent per combination-only bet. If there is more than one Rainbow 6 ticket with the winners of all six races, the carryover will continue into Saturday and could be in the $125,000 range. No matter what happens Friday, it is likely that $1 million or more will be bet Saturday on the Rainbow 6. That’s because Gulfstream will pay out the full jackpot, consisting of the full carryover and 80 percent of the day’s pool (20 percent takeout), even if there are multiple winners. The Saturday 13-race card has a first post of 12:00 p.m. with the Rainbow 6 on races eight through 13. On the track, Gulfstream’s stakes will include the third and final legs of the four divisions of the Florida Sire Stakes. In the $500,000 In Reality, Three Rules will seek a sweep of the two-year-old male division. In the $500,000 My Dear Girl, Cajun Delta Dawn will seek a sweep in the two-year-old fillies division. We will have coverage throughout the weekend, including on-site Saturday, on this Web site and on our blog. The Gulfstream Park West meet will open on Wednesday Oct. 5 at Calder. Gulfstream is holding the 40-day meet that will extend through Nov. 27.